The Charlestown Secondary School has been the recipient of two significant and valuable contributions from corporate entities on Nevis. On Tuesday February 20th, the school was the recipient of a three-part donation from the Four Seasons Resort Nevis. General Manager of the resort, Mr. Martin St. Clair, visited the school three weeks ago accompanied by Human Resource Manager, Mr. Chad James and were afforded the opportunity to tour the classrooms and was prompted to make the donation. “We visited every class when we were here, and were very impressed. We’d like to offer the school 2 Dell computers and 2 printers and we hope that you have a place for these in your new school. “I’d also like to take this opportunity to make a contribution of US$1,000 towards purchasing library books. We also have a check here, which is a small donation towards your annual house pageant coming up shortly on March the 3rd. So here we are and congratulations,” the general manager said. 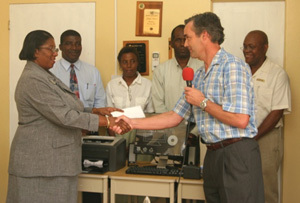 Receiving the monetary donations and computers on behalf of the Ministry of Education, Principal Education Officer Mrs. Jennifer Hodge expressed her gratitude and said she looked forward to long lasting relationships with the resort. Principal of the school, Mr. Edson Elliot, accepted the generous gifts donations and thanked the Four Seasons Resort whom he referred to as partners in education. “Yes I refer to Four Seasons as our partner, because Four Seasons has contributed enormously to the Charlestown Secondary School. I think the General Public should be aware that we have lots of activities here and almost for every activity we call on Four Seasons and they have always delivered. I would like to thank them very much for that” the Principal said. On Thursday, February 22nd, Lawyer Mark Brantley of the firm Daniel Brantley and Associates presented a cheque of US$5000 to the Literary and Debating Society of the Charlestown Secondary School. According to Mr. Brantley the firm had been looking for an organisation on the island to made the donation and decided to propose a three year partnership for sponsorship in debating competitions and other functions. “I am here on behalf of the firm Daniel Brantley and Associates just so members of the general public know this. It is my hope that you would put this money to good use, and it is also my hope that you would perform creditably as you’ve always done in the upcoming Leeward Island Debating Competition. We hope that it would help to give you a financial cushion as you try to do the important work that you continue to do” the lawyer said. President of the debating society Anslem Caines, expressed his gratitude for the generous donation and said he found comfort in the knowledge that society had persons who recognised the potential and the significant role the debating society can play and were willing to invest in the organisation for a period of time. The young student added that he hoped that contribution and enthusiastic support of the firm might yield a positive outcome in all the endeavours of the Literary and Debating Society of the Charlestown Secondary School. The debating team leaves Nevis next Thursday for Montserrat to participate in the annual Leeward Islands Debating Competition.